In the end of April I went down to visit the good people at Hacienda La Esmeralda in Boquete, Panama. This was my first time in Panama and having enjoyed drinking the Esmeralda coffee alot for the last couple of years I was very interested to finally go visit and see what it is that makes this coffee taste so different than any other coffee. After some amazing days in Portland, Oregon, withnessing the US Barista championship I was ready to trawel further down south to Panama and for some fresh mountain air. The first thing I noticed when I got to the area of Boquete was how lush the area is. I arrived pretty much right in the end of dry season and expected the land to be way drier. This is definitely one of the freshest greenest coffee growing areas I have been to. Boquete is located in an enclave of mountains with rain coming in from the Caribbean Sea from the north and rain from the North Pacific Ocean from south. This creates a crazy microclima around town, which has rain coming from the two different oceans on each side of the town. Therefore the coffee varies quite a lot even though it’s from such a small area. The high elevation along with the huge amounts of clouds almost year around coming in from the seas in Boquete, makes the use of shadow trees almost redundant. There still is a lot around but it is not crucial for the cherries to ripe slowly. Rachel Peterson was kind enough to take some time away from her very busy time schedule. I pretty much came just before the yearly auction and everything was very hectic and busy. For a couple of days Rachel showed me around their different coffee farms surrounding Boquete. The different lots that are called Esmeralda Special from Hacienda La Esmeralda are from different coffee farms. In some cases smaller lots get blended if they are found to suit each other. So in most cases the lot name is the name of the farm that specific coffee came from such as Montana and Mario San José but it is not always the case. 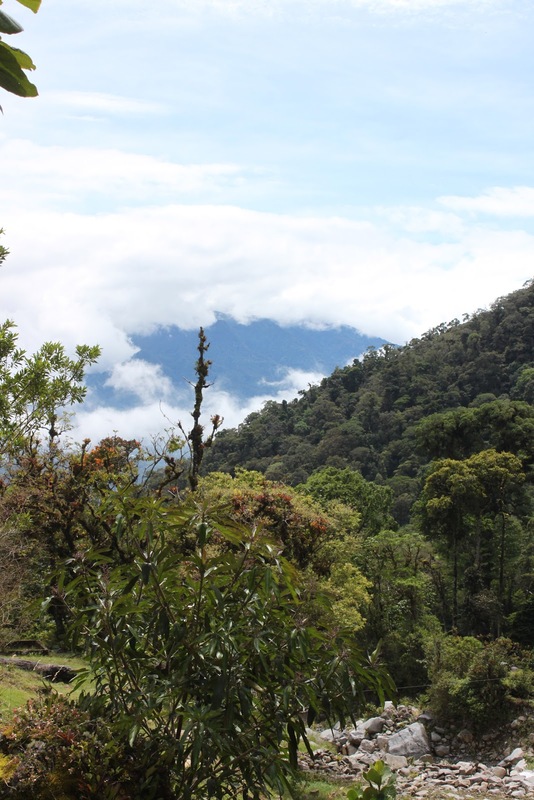 I have always wondered why coffees from this region and especially La Esmeralda have such distinct aromas. I have cupped a lot of Geisha coffees from other regions and other countries as well but nobody seems to be able to create the same distinct flavour. One of the main reasons, as Peter also mentioned in his blog post from when he visited, I think is that they cup a lot. And they are very good at cupping. The Petersons are very aware about what they look fore in the cup. This along with their extreme quality in their drying of the coffee I am sure is what results in this great flavour. They use demucilators to remove the pulp. Then wash and dry using both patio and mechanical driers. They do all of this in house so they have total control of the quality all the way from when they plant the coffee to the green beans are ready to ship. 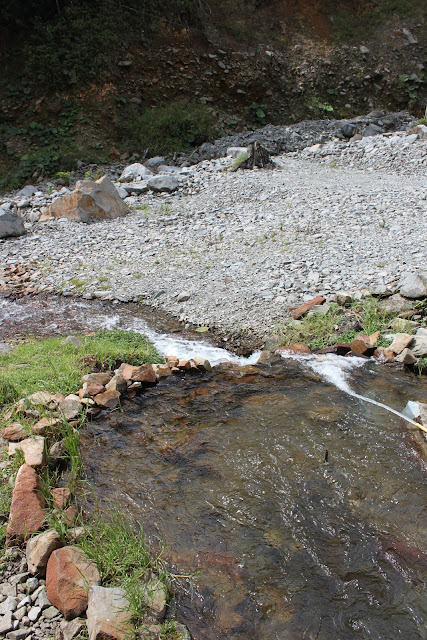 Another thing that stroke me was the water from Boquete. The first cupping I did there I noticed that the coffee tasted like nothing I have ever tasted before. The body, aromas and sweetness in the cups were crazy. Therefore I got a sample straight out of the mountain to bring home for analyzing. It is the cleanest water I have ever measured. With a content of only 7 ppm! Is this what causes such great tasting coffee? That they get so much flavour from their brews, which result in them having it, easier to tell if they did something good? Kieni Espresso is back ! Back by popular demand: Kieni Espresso. There was quite an outcry last fall when we finished with the Kieni Espresso, so we're very happy to re-introduce it to our line-up. This is also the coffee that Torfi used for the WBC and Danish Barista Championship. It's of course the fresh crop that came in a few weeks ago. It's extremely lively and aromatic. A real fruit bomb of an espresso. Ripe black currants and fresh raspberries dominate the aromas. Still is has a oily mouthfeel with great sweetness and vibrant aftertaste. We've roasted this a little slower but it kept it quite light for an espresso, in a way where we've managed to keep the aromas but muting the acidity a little bit. The result is an espresso out of the ordinary with wild aromas and amazing flavour. The Kieni Espresso will be available in our coffee shops on Friday and through our webshop. We’re ready! After many weeks of building and renovating, we’re now ready to officially open our new roastery and third coffee shop. Friday June 15th at 7.30 we open the doors to The Coffee Collective Roastery & Coffee Shop on Godthåbsvej 34b, 2000 Frederiksberg. The Loring SmartRoast is now operational and we’ve already roasted the first batches. We’re very excited about what we’ll be able to do with the new roaster. So far it looks extremely promising and we’ve seen improved clarity in the cup. We’ll try to write more about what we experience later on. On the brewing side of things, we’ve also had a few weeks to get to know the La Marzocco Strada. Pressure profiling is certainly an interesting thing and the Strada is a joy to work with. For all the black coffees, we’ve installed an Uber Boiler from Marco and it’s simply splendid. We’re actually happy to see how fast it works and how precise the temperature is. The build in scale is also such a nice feature. It’s situated in the middle of the bar, so you can have full view of how we brew your coffee. All in all we just really look forward to bid you welcome to our new place. In many ways this bring back memories to when we opened in Jægersborggade. That was a big step for us back then, just like this is for us now. And we’re very humbled and appreciate all the warm wishes we’ve received from our customers, friends and colleagues abroad. Hopefully we get to see a lot of you on the 15th. 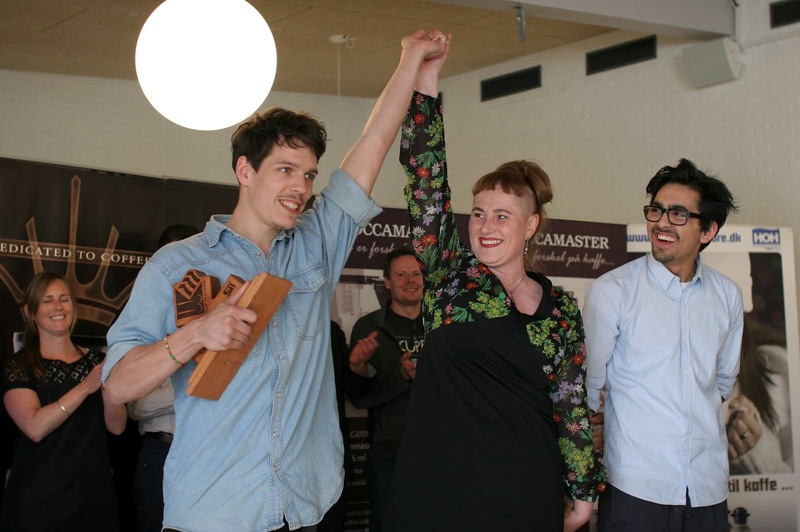 A few weeks ago one of our baristas won the Danish Barista Championship. Today we had his grand rehearsal before going to the WBC and we thought we should probably introduce him a little better to the readers of this blog. His name is Torfi Þór Torfason. Yes, that's not a traditional Danish name. Torfi hails from Iceland and has been living in Denmark with his wife and daughter for the past 3 years. Before getting into coffee Torfi worked as a chef at some of the best restaurants in Denmark and Iceland, amongst other michelin-starred Ensemble (now closed unfortunately), Umami and Dill. But a growing interest in coffee and the desire to be closer to the guests brought Torfi our way, for which we are very grateful. After working with us full time as a barista for about a year Torfi took on the challenge of roasting as well, and together with Casper he has been responsible for roasting pretty much all our coffee until recently, when the competition has taken over more time. Torfi has selected and roasted his own coffee for the competition and has been dialling in the roast profile he wanted for the past many months. Since the Danish championship he's been working hard on bringing his ideas to life for the WBC. Today he absolutely nailed it for his last run-through of his presentation. To test his nerves we had invited a bunch of friends and colleagues. Amongst them Troels Poulsen and Martin Hildebrandt - two of the former World Barista Champions - who gave great feedback and helped both testing Torfi's nerves and get him absolutely ready for the WBC. A big thank you to everyone who showed up and helped cheer and act as audience for Torfi. On behalf of the whole collective we wish Torfi, his family and his helper Omar (Danish 2nd place finisher) a fantastic trip to Vienna. We would all be going there if it wasn't for the big project of opening our new roastery and coffee shop taking all our time as well as some of us having babies and stuff. Linus will be going and we hope that everyone there will help cheer for Torfi for us. We will definitely be watching the live stream and sending good vibes. Vi søger en fuldtid kontormedarbejder. The Coffee Collective er startet i 2007 af de 4 ejere, som i dag driver virksomheden. De seneste år er vi vokset en del og er nu i alt er ca. 35 medarbejdere fordelt på tre kaffebarer, risteri og kontor. Vores administrative opgaver forøges i takt dermed. Derfor søger vi nu en fuldtids kontormedarbejder til vores nye kontor i forbindelse med vores risteri og kaffebar på Godthåbsvej 34B. Vi tilbyder arbejde i et innovativt, ungt og dynamisk miljø. Vi brænder for at udvikle og udbrede kvalitetskaffe fra de bedste producenter i verden. Du vil være den faste person på kontoret, og der vil derfor i tillæg til de primære opgaver være kontoropgaver, som aflaster de andre ledende medarbejdere i virksomheden. Herunder vil der specielt være en del ad-hoc opgaver fra vores direktør. Vi forventer, at du kan arbejde serviceminded, struktureret og ansvarsfuldt. Kontoruddannelse og/eller -erfaring er en nødvendig forudsætning. Erfaring med bogholderi er en stor fordel, men er i sig selv ikke et krav. Interesse for kaffe vil i sagens natur også være en fordel. Stilling bliver lønnet efter kvalifikationer. Tiltrædelse vil være 15. august 2012. Deadline for ansøgninger er fredag d. 15. juni. eller med post til The Coffee Collective A/S, Jægersborggade 10, 2200 København N eller kom ind med den i en af vores kaffebarer.